At a recent event (held on 29th September 2011) at Leicester University (UK) – ‘Building new collaborations in eco-housing research and practice’ – there was extensive inspiring discussion about the future of eco-housing. Talks included understanding young people’s perspectives of new ‘sustainable’ urban design and the user experiences of environmental technologies. 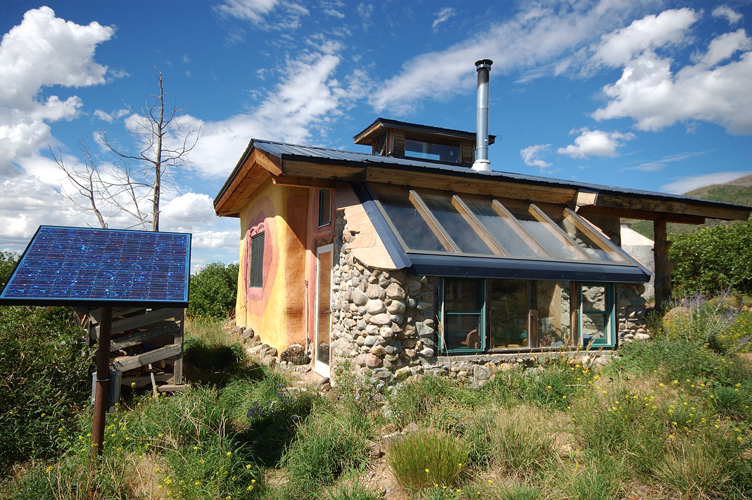 Others explored whether kit, people or places are the most important things to consider when building, and what we could learn from understanding self-built low cost eco-housing, like the one pictured here in New Mexico, USA. Each talk incorporated a different approach to understanding eco-housing – cultural understandings of what houses and homes mean, children’s geographies, architectural perspectives and scientific understandings. It was a truly interdisciplinary event with participants from the disciplines of civil engineering, anthropology, architecture, environmental science, geography, urban affairs and planning, and practitioners from social housing groups and climate change action groups. Productive and fruitful discussion was had as ideas and different experiences and perspectives were shared in the final panel and roundtable session. Thanks to everyone who attended and I hope that these conversations will be continued and new research collaborations will emerge. I hope to post up links to the talks (which were recorded) soon. Previous PostColumbia Eco-village, Portland, OregonNext PostWhat makes a house an eco-house (in Britain)? It feels as though Universities are leading the way at the moment, and it is great to see, so many fresh and inspiring ideas. I recently watched a documentary on the olympic park and how they were creating eco friendly ideas – these kind of ideas on this level and at housing level that will really shape how we build in the future. This is really Interesting! You can also check out (blog[dot]siemens[dot]co[dot]in) to know more about the latest technologies related to green building. Very interesting article on Sustainable urban building. Many thanks, great blog! Keep up the great work!